Learning how to hang drywall can save you hundreds of dollars during the typical remodeling project. While professional drywall hangers take years to perfect their skills, the careful homeowner can hang drywall without help. Finishing a room with drywall requires a few essential tools and materials that can be purchased at a store like Home Depot or Lowe's Home Improvement Store. Drywall- Drywall is the common term for gypsum board. It comes in four foot by eight foot sheets of varying thicknesses. Standard thickness is 5/8 inch, and should not be deviated from unless dictated by the code or for special design purposes. Electric screwdriver- While nails can be used, a screwdriver is often quicker when covering large areas. Use 1 ¼ inch coarse thread sheetrock screws with the screwdriver. Putty knife- At minimum, have a six inch and eight inch wide knife to use when mudding. A wider blade, such as a twelve inch blade, is preferable to the narrower eight inch blade. Joint compound- Also called mud, joint compound should be bought premixed. Mix the compound lightly before use, but don't mix so strenuously that you introduce air bubbles into the mud. Drywall tape- Use plain tape, made of paper, with a slight seam in the center. Specialty tapes should only be used for special applications. Corner beads- For every outside corner, you'll need a metal corner bead to protect the drywall. Sanding sponge- While some people prefer sandpaper, these sponges are easy to use for small touch ups as well as larger projects. In most cases, homeowners hang drywall over studs that were once covered with some other material. In order to hang drywall correctly, all of this covering must be removed. Fasteners, such as screws, nails, or staples, must also be removed from the studs. If the fasteners cannot be easily removed from the wall, they can be driven further into the stud until the fastener is flush with face of the stud. While the studs are exposed, mark the floor and ceiling to note each stud's location. This will make them easier to find when you are hanging drywall. Once the wall is prepared, hanging the drywall is a simple task. Use a few pieces of wood that are 3/8 inch wide to hold the first piece of drywall off of the floor. Always start from an inside corner, hanging the drywall horizontally. Cut the drywall so it ends in the center of a stud. This will allow you to secure the ends of both pieces of drywall to the stud. Check for any electrical socket or light sockets that will be covered by the drywall. Cut rectangular openings in the drywall for these devices before hanging the drywall. Screw into the drywall and into the stud behind the drywall, spacing the screws every 8 inches along each stud. Countersink each screw so you can cover the head later. Continue using this method to secure the rest of the drywall, staggering the vertical seams as much as possible. Mudding is the most challenging part of working with drywall. Hiding the drywall seams under layers of joint compound and tape is difficult, especially if you desire a smooth wall. Start mudding the wall by applying a thin layer of joint compound onto the drywall seam using a trowel. The layer of mud should extend three inches on either side. Place the tape over the drywall seam, trying to match the center of the tape with the seam as much as possible. Press it into place with your hands, making sure there are no bubbles or creases. Apply a small amount of mud over the drywall tape, creating a smooth layer of mud over the seam. Use a clean knife to remove as much of the joint compound as possible, without exposing the tape or creating any bumps. Allow the wall to dry for at least eight hours. During this time, you can fill in screw heads with a little bit of putty on the edge of a knife. Sand the dried joint compound lightly, removing any bumps or ridges. Using a knife at least eight inches wide, add a small amount of joint compound to the seams to make them as smooth as possible. Allow the seams to dry and sand them lightly. Apply another coat of joint compound if necessary. Corners require special treatment while mudding. However taking the time to finish and reinforce the corners can extend the useful life of the wall. Fold the drywall tape in half, using the guiding line imprinted into the tape. Add mud to the corner and press the drywall tape into place. Use the same techniques to finish flat seams in order to finish the inside corner. Cut the metal corner bead to cover the entire length of the corner. Screw it into place to cover the corner, using screws spaced every eight inches. 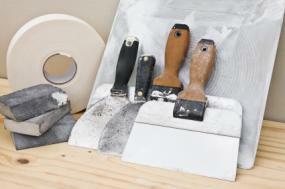 With a generous amount of mud on a putty knife, cover the corner bead. Allow the corner to dry and sand away imperfections. Continue applying layers of compound until the corner bead is covered. Even with careful mudding, a novice may still see the drywall seams. In this case, a light texture can be applied over the entire wall to hide the seams using joint compound. If you do not want to have textured walls, it is important to practice in hidden areas before undertaking larger jobs. Learning how to hang drywall can be difficult and is not for every homeowner. Homeowners who want untextured, flawless walls will have to call a professional who has extensive experience hanging drywall. Once the walls are in place, you can maintain their pristine appearance by fixing any damage using a drywall repair kit.